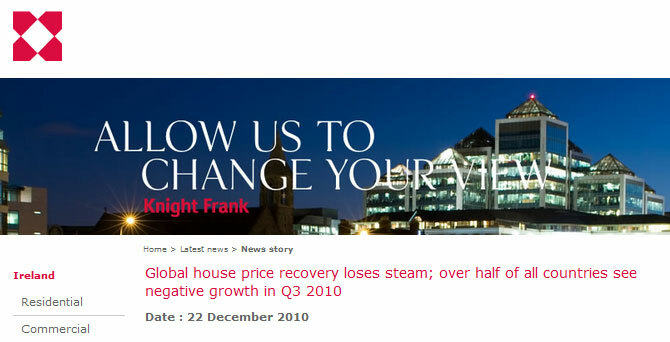 The latest Knight Frank Global House Price Index, which covers Q3 2010 results, makes for some pretty sobering reading, particularly if you own a property in Ireland. 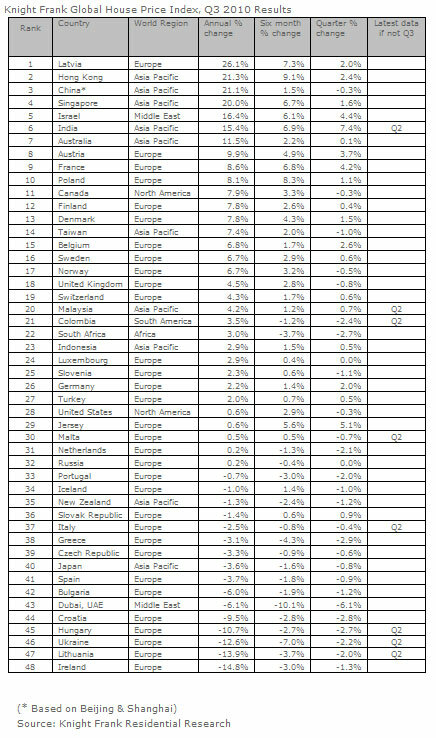 The basics of the findings are that average annual global house price growth in Q3 2010 stood at 3.1%. The strongest world region was Asia-Pacific with average growth of 9.9%, and the weakest was Europe at 0.8%. Although unspectacular the Q3 2010 growth rate is up substantially on the Q3 2009 figure of -6.2% when most European markets were in a serious nose-dive. The rate is, however down on the 4.3% for Q2 this year, when it was felt that there could be a global rebound in train. The most pressing concern is the number of countries going back into negative growth in the most recent quarter; 14 (mainly European) countries saw negative growth in Q3 after they had experienced several quarters of rising prices. Overall 67% of all countries saw positive annual growth but only 46% experienced growth in the most recent quarter. There also appears to be a growing gap between the less debt-afflicted European economies of Austria, France and Finland (ranked 8, 9 and 12 in our league table) and their neighbours to the south and west of the continent, with Greece, Spain and Ireland ranking 38, 41 and 48 (out of 48) respectively. Ireland, in particular, fared very badly recording a 14.8% drop in prices in the year to date to the end of Q3 2010 and finding itself propping up the list. One positive note, however, is that former economic basket case, Latvia, has now stormed to the top of the list with 26.1% growth in the YTD (following the near total collapse of its property industry over the past few years). This is, of course, totally unsustainable growth, but at least it is a reflection that IMF and ECB intervention doesn’t have to be the end of life as we know it. Liam Bailey, head of residential research, Knight Frank, comments: “There is a positive story to take from the latest results of the Knight Frank Global House Price Index. For the first time since late 2008 prices are rising in each of our six world regions (Asia-Pacific 9.9%, Middle East 5.1%, North America 4.2%, South America 3.5%, Africa 3.0% and Europe 0.8%). “At the same time prices are rising in 67% of the 48 countries we have reported on this quarter, on an annual basis. “Unfortunately these upbeat headlines do not tell the full story. Digging into the data we can see that there are still considerable issues playing out across the global markets. While a majority of countries are reporting positive annual growth, 56% saw prices fall in Q3 this year. “There is growing evidence that the global housing market recovery, which began in early 2009 following the desperate conditions in 2007 and 2008, may just be beginning to run out of steam. Nearly 30% of countries which had experienced strengthening conditions in 2010 saw quarterly price growth turn negative in Q3 2010. Led by European markets the list includes: Greece, Iceland, Netherlands, Norway, Portugal, Slovenia and the UK. Outside of Europe the list also extends to cover: China, Canada, Columbia, Dubai, New Zealand, South Africa and Taiwan. “The average performance of the European economies has improved but the picture reported for individual European countries varies dramatically, with annual growth ranging from 26.1% in Latvia to -13.9% in Lithuania and -14.8% in Ireland. “The performance of Latvia’s housing market in recent years has proved extremely volatile. 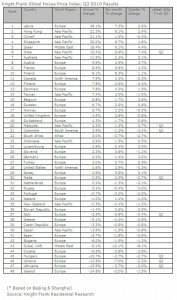 In Q3 2009 Latvia was ranked at the bottom of our Index with house prices having fallen by 70% since the mid-2007 peak. Now Latvia leads our table. Following a combination of tax rises and austerity measures such as budget and wage cuts, industrial production has picked up with GDP reaching 2.7%. in Q3 2010. Residential demand has been further boosted by a new Latvian immigration law which came into force on 1 July, relaxing residency rules for foreign investors. “Parallels have been drawn between Latvia and Ireland – in both cases the recession was borne out of a consumer-driven boom and bust and both governments have imposed strict fiscal tightening measures. In addition, neither country has been able to use its exports or devalue its currency to minimise the fallout from its economic turmoil. In Latvia house prices have started to climb again since Q3 2009. House prices in Ireland, by comparison, are still following a downward trend with price falls of 36% recorded to date, with declines of up to 50% recorded in Dublin. However, the latest results show the rate of decline is slowing with prices falling by 1.3% in the third quarter compared to 1.7% in the previous quarter. “In the US annual price inflation has fallen back to 0.6% compared to 4.2% in Q2 2010; average prices in the US now stand at their mid-2003 level. Whilst the weakening of growth in Q3 is partly due to the end of the government’s tax incentive for first-time buyers, the additional issue of high supply volumes, much of it hidden due to pending foreclosures, is continuing to blight the housing market. “Efforts to cool the Asian housing markets appear to be taking effect with more muted quarterly growth recorded in Hong Kong, Singapore and China in Q3 2010. “In China, central government intervention in the housing market, mainly aimed at controlling strong price growth, is being focussed on increasing the supply of affordable housing. The government plans to provide more support for developers of low-income housing, but crucially it has stated that it will hold provincial governments accountable for failing to curtail price inflation by not expanding their own affordable housing programmes. “Our Hong Kong-based research team reports its confidence that prices in China’s key cities may avoid a significant correction in prices, especially as local governments fine-tune their land supply programmes. Despite this positive outlook they still anticipate price falls of up to 20% in Beijing, Shanghai, Guangzhou and Shenzhen in 2011. “Fears over the impact of the expanded US quantitative easing programme on asset prices in Asia has prompted China to step up capital control to resist foreign fund flows into its property market. In fact, the imposition of capital controls in a number of emerging markets in recent months, suggests the potential for the trend towards unfettered capital flows over recent decades will be reversed. 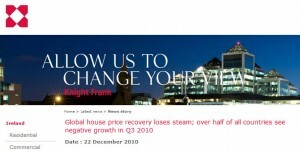 To see the Knight Frank report click here.